Hey photographers!! Here’s a little something special for you! 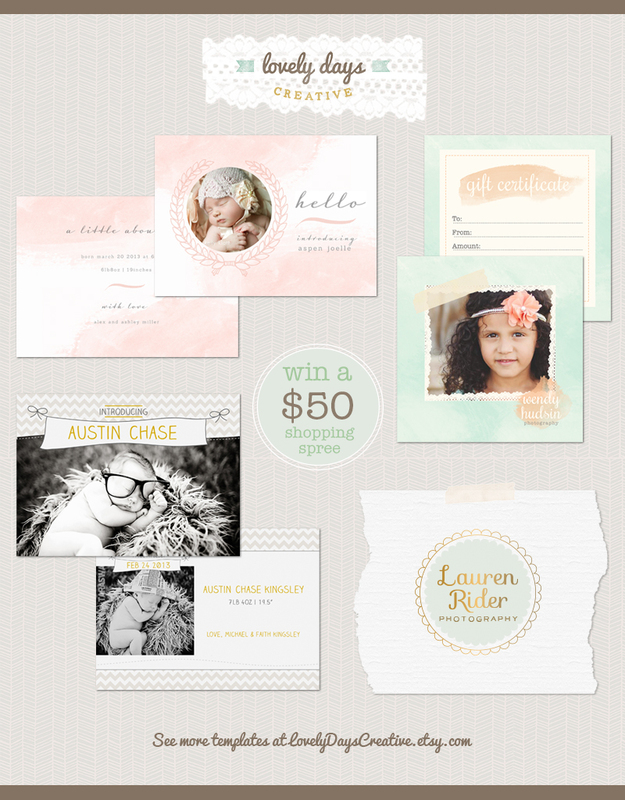 I’m so excited to partner with Sheri from Lovely Days Creative. Her work is absolutely beautiful and she has a huge variety of items available to her customers. Lovely Days Creative is a design boutique featuring beautiful template designs made exclusively for photographers – designs that reflect their style and passion. The templates in my shop are designed to showcase a photographer’s beautiful images in an eye-catching way while saving them time. They have all been created to be extremely simple to use and always come with full instructions. I’m proud to say that I offer genuine, unmatched customer service with every sale. I welcome any questions about how to use the templates or design in general and am always happy to help any way I can! Swing by my Facebook page and say hi! I’d love to meet you! Grab a freebie while you’re there! My hope is that Lovely Days Creative will become your preferred destination for beautiful, current designs for your business. As part of Lovely Days Creative spotlight she has offered to give one of you lucky readers a $50 shopping spree to her store! There’s nothing more than a shopping spree! Visit Lovely Days Creative Etsy shop, browse around, and leave a comment below stating how you would spend your shopping spree. I like Lovely Days Creative on Facebook! I like Grateful Imperfections on Facebook! I liked Lovely Day Creative on Facebook. I liked Grateful Imperfections on fb. I would love to win! I seriously just purchased a template today from her etsy shop. I love it and would love to buy some more! I love all of her work! I just recently purchased a marketing set from her. She's great to work with and her sets are so easy to use. I'd like anything she makes. Really. I love her designs and would most likely pick out some cute cards or a marketing set! I liked Lovely Days Creative on Facebook! Hi there, I would spend it on either marketing set and forms or the Birth Announcements! They are absolutely adorable! Hello! I would spend this spree on forms and marketing templates, not sure which ones though, all are so pretty!!! And I've shared on Pinterest, thanks so much! I would spend it on a marketing template! I would love to purchase the contract bundle and the Mini session templates:). Love her work! I'd spend it on a marketing template and then a christmas card or two. I would get a markting set to start my new business!! I've had my eye on LovelyDayCreative products for awhile now. I'd love to have a marketing set! I like Lovely Days on FB! I would really like a print release card! I like Lovely Days on FB.